ready to become thoughtful leaders and positive changemakers in the public, private and nonprofit sectors. a groundbreaking program that demonstrates how to confront global challenges and spearhead transformation at companies and organizations around the world. highly competent professionals who drive sustainable development and thrive in an international environment. In today’s globalized and digital world, massive societal and technological shifts are affecting every region, country and continent. As traditional forms of governance and diplomacy adjust, we need individuals with a global perspective who can navigate the increasingly complex webs of international affairs and foreign policy. Now is the time to gain the professional skills, multicultural experience and leadership capabilities needed to become a changemaker in this dynamic global ecosystem. 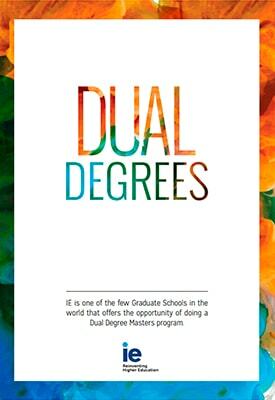 If you’re drawn not only to global affairs, but also to the rapidly evolving world of business, this Dual Degree program could be the perfect fit. It combines IE Business School’s highly renowned International MBA with the Master in International Relations from IE School of Global and Public Affairs. In less than two years, you’ll build a solid foundation in the most important aspects of business administration and management, plus a thorough understanding of international affairs, strategic diplomacy and comparative regional studies. This intensive program is designed for extremely ambitious students who are looking to obtain a combination of business expertise and experience in international relations. You’ll gain the flexibility to adapt your skills to a variety of sectors, and rise above the competition no matter what path you choose to pursue. You’ll thrive in the world’s most challenging settings, thanks to the firsthand experience you’ll already have under your belt. Upon graduation you’ll be perfectly positioned to drive sustainable development and social change, and poised to join the next generation of world leaders.